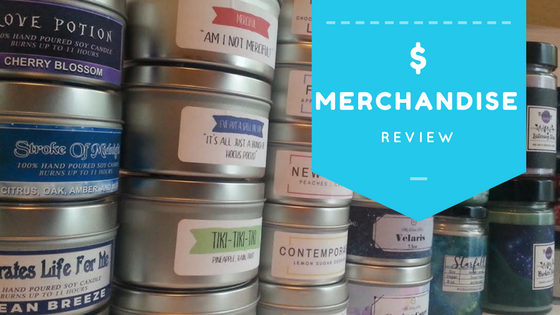 I want to kick off a new-to-me feature here on Mary Had a Little Book Blog: merchandise reviews! Bookish merchandise has really exploded in the YA community thanks to cool publisher bonus swag, bookstagram, and subscription boxes for every imaginable genre and fandom. I'm going to take some of the shops and boxes that I've tried out and give you guys a look at my experience with the shops and their merch. 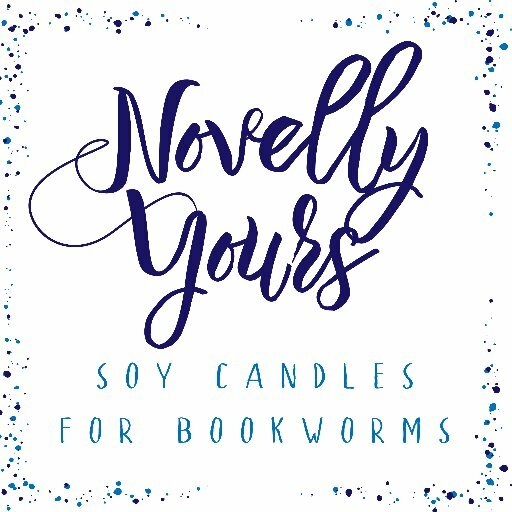 First up is the shop that got me into candles: Novelly Yours! At this point, everyone should know Brittany's shop Novelly Yours. Brittany got in this candle game way back in Fall 2015 and has been killing the candle game ever since. Disclaimer: I have only ever purchased candles from Novelly Yours or won them in giveaways so this is just me gushing about them as an extremely satisfied customer. Fandom wise, I think Novelly Yours does a great job with item variety. There are plenty of candle shop staples like Harry Potter, Sarah J. Maas, Leigh Bardugo, Maggie Stiefvater, and Marissa Meyer items, but there are also a TON of other great unique options like Outlander, The Winner's Kiss, The Princess Bride, Illuminae, etc! But wait! There's more! There's also a fun Disney princess collection and several unique sets of generally bookish candles ON TOP of 2-3 seasonal or limited edition candles offered on a limited basis for a few months. Oh, AND Novelly Yours offers custom candles for individuals or for bulk orders. Just contact the shop for info. Novelly Yours is constantly creating fantastic new products. Just in May, there have been the two candle-of-the-month additions, an amazing "pirates and rogues" set, Strange the Dreamer, another ACOWAR candle, a Bellas candle (from Pitch Perfect!!!!! ), and a couple others. Like, that is a LOT of new stock! Whatever fragrances Novelly Yours uses in the candles, I really like them. I haven't disliked a single candle yet. Although some scents like coffee or pine tend to not be my favorite, I still order candles that include them because each candle is blended with several scents that make each one unique and alluring. I do know some of the candles don't have a strong throw so if you are worried about scent strength, I highly recommend checking out the shop FAQ or using the contact form to find which candle will be the best fit for you! Novelly Yours gets ALL THE STARS. I've once contacted Novelly Yours to help me with an order that I bumbled, and Brittany responded immediately and was able to help. One time she accidentally mailed one of my packages to my previous address, and she totally got that fixed asap. But it's the other things. Brittany responds to tweets, Twitter DMs, Instagram comments, and Instagram DMs (I'm assuming she does on Facebook as well). She's incredibly involved with and responsive to her customers. She takes questions and requests via the contact form and maintains a shop blog where she not only makes announcements but also answers all your burning candle questions (heh. Pun intented). I love that if the demand for a limited edition candle is there, she makes it a permanent addition to the shop. Even when she retires candles to make room for new ones, she's always bringing back the old for fans to buy their faves. Brittany is a shop owner who knows and understands her customers and does her best to make sure they're happy AND that her shop is successful. Romance trope - smells like love is in the air! She's totally the best! I've tried a lot of other shops now, and she's still my favorite. I love candles and to have themes for them is just a plus. I love having candles for all my favorite books, characters, and ships! I love this feature! I've only ever bought one bookish candle and there are SO many options out there that is can get overwhelming. Seeing your experiences and recommendations really helps! I have never heard of this site. Just added it to my favorites on Etsy. I can't wait to peruse. Mermaid's Grotto and Beast's Library sound so good. I love the sea and libraries.